More than 250 days have passed since the decision to hire Achilles Goss as FC Lorient manager, and we now know the kind of football the South Breton club is playing under Monsieur Goss. We do know the 71-year-old manager has every intention of staying on to push a Ligue Un promotion charge through. But we don't know whether it's realistically possible, whether FC Lorient can overturn their fragility from set pieces or their lethargic attacking movement upfront and mount an effective challenge via the Ligue 2 Play Offs. Results since the Winter Break (January-March). Live Reporting: How the action unfolded at the Stade du Moustoir. We don't know which player is going to make the difference in the final 2 months of the season - a hero still needs to be found. And, most glaringly, we actually don't know if Monsieur Goss will still be in place to try to push his team on over April & May. The final two months of Season 2018/19. The fans, for today at least, are at the mercy of events not in their control. Goss' vow to stay on tonight does not make his deep, deep problems disappear. With their fans in revolt, after a collection were seen departing with 10 minutes to go Vs Brest - some determined to usher Goss out of office - we can't, and don't know yet, what Chairman Loïc Fery has planned. This could be a gale that's weathered in a few days, or a serious storm that sweeps Achilles Goss away. But while the Head Coach's future is so uncertain, so is FC Lorient's. Ligue 2 table, as it stands: 17 March 2019. I took a brief pause with my save, mainly through frustrations with my attacking play and movement of my forwards. In order to wait on a few fixes, I slowed my game speed by watching games in Full Match mode, but this only heightened my awareness to some of the match engine issues. Never mind, a fix will come and all things will be rosy again in Brittany. 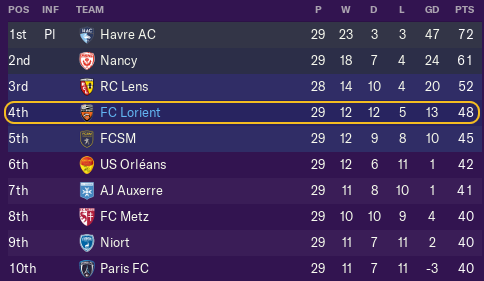 I’m still confident of finishing on a high, we’re not that bad in the league and we’ve got a chance to reach a French Cup Semi Final. This post was a bit quirky, and you’ll get different experiences from it relating to how deep into the rabbit hole you go. Enjoy. As always, thanks for reading/sharing & caring.